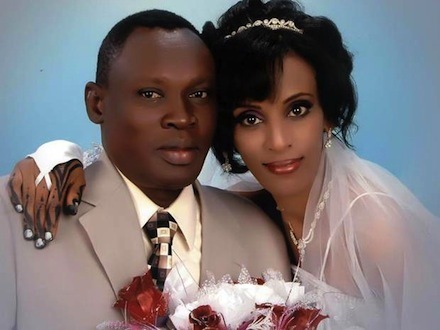 Meriam Ibrahim, a Catholic woman convicted of apostasy for abandoning Islam who was released from prison in Sudan yesterday, has been re-arrested, according to reports. Mrs Ibrahim, 26, was arrested with her family at Khartoum airport earlier today, according to the BBC. About 40 security agents are said to have detained her with her husband Daniel Wani and two sons. On Monday, Mr Wani, a US citizen, said the family intended to leave for the USA. Antonella Napoli, head of an Italian aid organisation, tweeted a photograph of her telephone text message exchange with the lawyer who said the couple was arrested by the Sudanese secret service. CNN reported it received the same information from Ibrahim’s lawyer and that its reporters spoke briefly with Mr Wani, who said he and his family were being held at the national security office. Mrs Ibrahim was sentenced to death in May, triggering an international outcry. While in prison, she gave birth to a daughter and her one-year-old son had also been in prison with her. Earlier today the official state news agency Suna said that her conviction had been quashed by the court of appeal and ordered her immediate release. Mrs Ibrahim joined the Church shortly before she married her Christian husband, Mr Wani, in December 2011, according to a statement released earlier this month, signed by Father Mussa Timothy Kacho, episcopal vicar for the Archdiocese of Khartoum. The statement had urged the courts to review the case. Mr Wani, who lives in New Hampshire, was refused custody of their son because, under Sudanese law, a Christian man cannot raise a Muslim child. Earlier, the Khartoum Archdiocese said Ibrahim’s Sudanese Muslim father abandoned the family when she was faith, and she was raised according to her mother’s faith, Orthodox Christian. “She has never been a Muslim in her life,” the archdiocese said. “There are many people trying to persuade Meriam to renounce Christianity in order to be freed, but she is refusing. Some people are pleading with her husband to convince her to abandon Christian faith in order to save her life, but to no avail,” the archdiocese said. In a May joint statement, Sudan’s churches said the charges against Mrs Ibrahim were false and appealed to the Sudanese government to free her from prison.